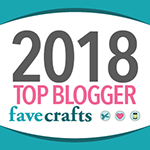 I put the patterns for the Jungle Finger Puppets on moogly a while ago – including the Lion, Monkey, Zebra, and Wild Man – and now it’s time to share the pattern for the Jungle Finger Puppets Carrying Case! 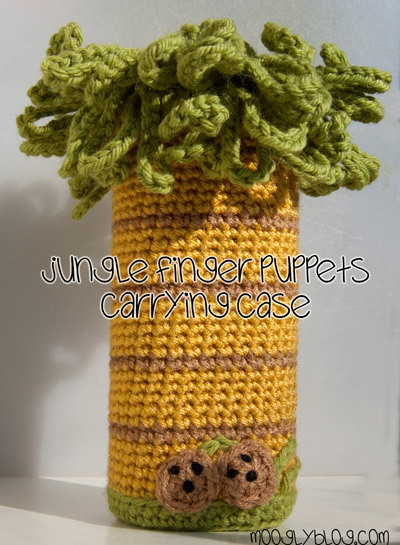 The Jungle Finger Puppets Carrying Case is made to look like a jungle tree, complete with coconuts laying at the base. The top has a drawstring handle to keep it closed, and the whole thing is built around a plastic drink mix container, so it’ll stand up to what the kids dish out. 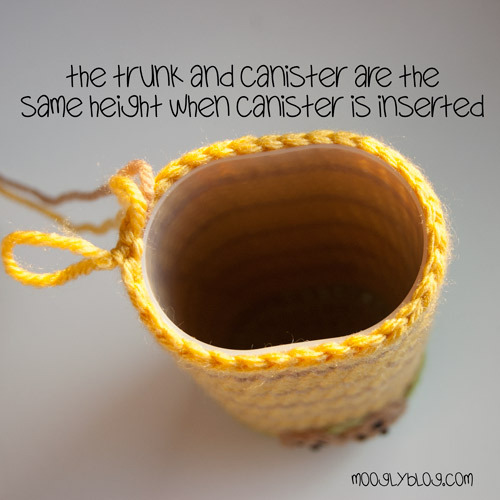 If you can’t get a hold of the specified container, you’ll need to change up the base a bit and the stitch count will be different, but the basic idea and rounds should translate pretty easily. 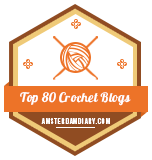 NOTES: Be sure to check out the Jogless Stripes tutorial on Needle Noodles before starting so you get the best “tree truck” possible! Also try the cozy on the container as you go, to check your gauge and make sure you are getting a snug fit. Please note that the puppets are small and not tested for safety – in other words, do not make them for children under 3 years old. Remove the plastic label from the drink mix container and discard label and lid. Round 4: Ch 1, sc in first 4 sc [2 sc in next sc, sc in next 2 sc] 3 times, sc in next 4 sc, [2 sc in next sc, sc in next 2 sc] 3 times. Join to first sc with sl st. (32 sc) At this point the oval should match the base of the container. Round 6: Ch 1, sc evenly around. Join to first sc with sl st using yellow yarn and the jogless method linked above in the notes. 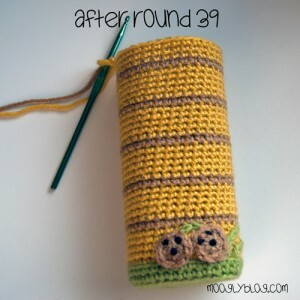 (32 sc) Break green yarn and continue with yellow yarn. Round 7: Ch 1, working in BLO, sc evenly around. Join to first sc with sl st. Round 8 – 10: Ch 1, sc evenly around. 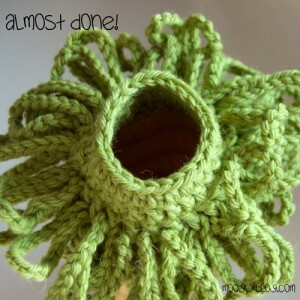 Join to first sc with sl st. Stop and weave in the loose ends (2 green, 1 yellow) now. Round 11: Ch 1, sc evenly around. 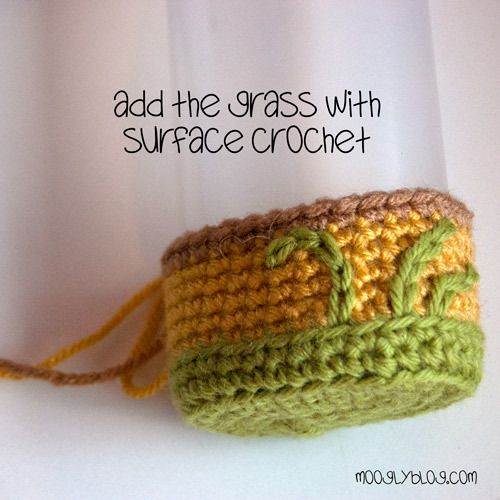 Join to first sc with sl st, using jogless method to join with brown yarn. Do not break yellow yarn. Round 12: Ch 1, sc evenly around. Join to first sc with sl st using yellow yarn. Do not break brown yarn – carry it along inside for next stripe. Add crochet “grass” with surface crochet, as seen below. 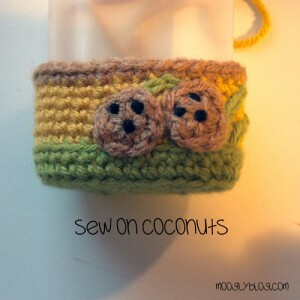 Sew on coconuts. 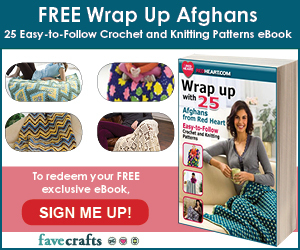 This is freehand – make yours unique! Round 13 – 17: Ch 1, sc evenly around. Join to first sc with sl st. At end of Round 17, join using jogless method with brown yarn. Round 18: Ch 1, sc evenly around. Join to first sc with sl st using yellow yarn. Round 19 – 36: Repeat Rounds 13-18 3 times, until you have 5 brown stripes made with the yellow sections between. Round 37 – 39: Repeat Round 13 3 times, or until the tree trunk is the same height as the plastic container, as shown below. Add or subtract rows as needed to get the correct height. Cut brown yarn and weave in end. 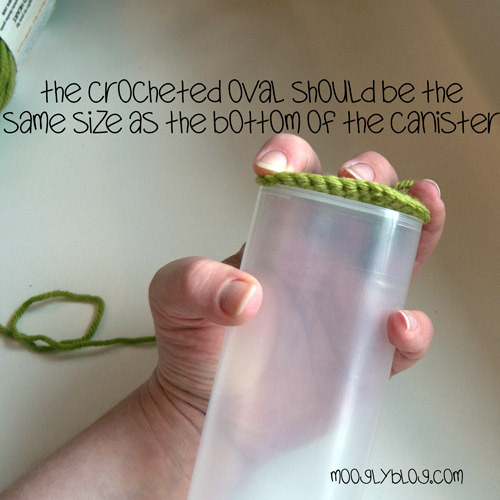 Make sure all other ends are woven in and trimmed as desired. Round 40: Insert container. Ch 1 and [sc in 2 sts, sc2tog] 8 times. (24 sc) This holds the container in the tree trunk permanently. 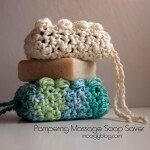 Break yarn and use seamless join to finish off, weaving in end between plastic and trunk as much as possible. 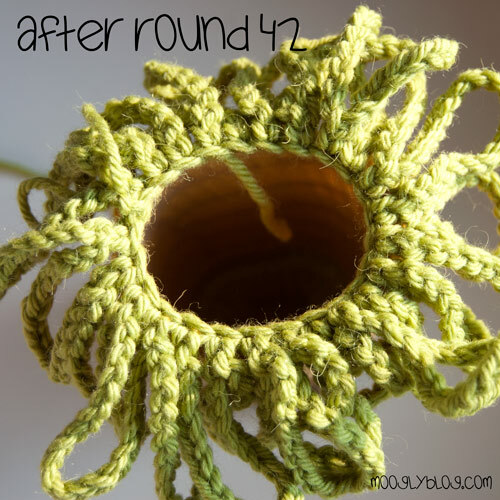 Round 42: Ch 1 and sc in the FLO of the first st. [Ch 20, sc in FLO of next st] 23 times. Ch 20, sl st in first sc. 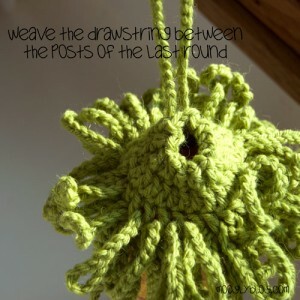 (24 ch 20 loops made) Weave in green starting end. Round 46: Ch 1, hdc in each st around. 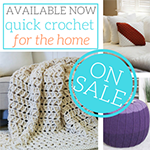 (24 hdc) Break yarn and use seamless join to finish off. Weave in end. 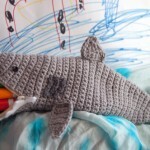 Using green yarn, ch for 12 inches. 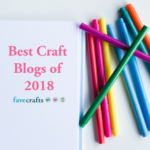 Optionally, cut a 12″ length of matching green ribbon. 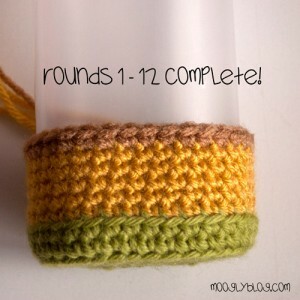 Weave chain (or ribbon) between stitches of Round 46. Tie or sew closed. 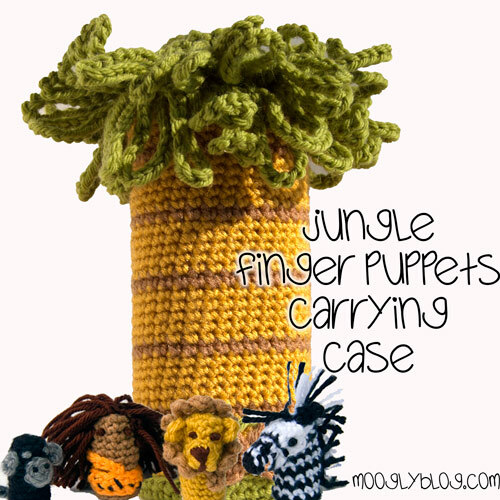 Add a set of the jungle finger puppets (all free patterns right here on moogly! 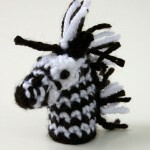 ), and you’ll have a complete Jungle Finger Puppets set with case, ready for gift giving! 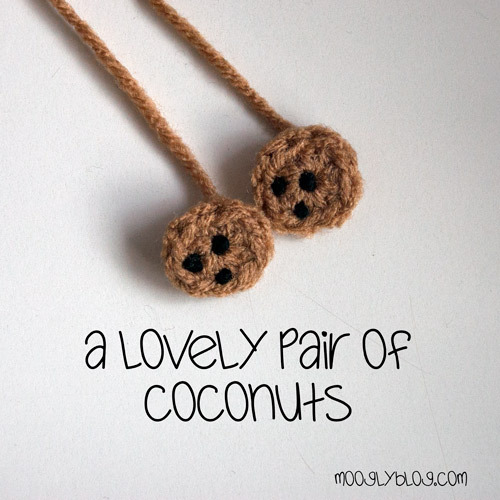 These are great for holidays, birthdays, or just because. 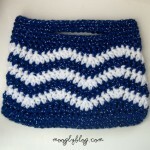 I have used website for pattern to make Chinese Waves Pouch and I really like the knit pattern. 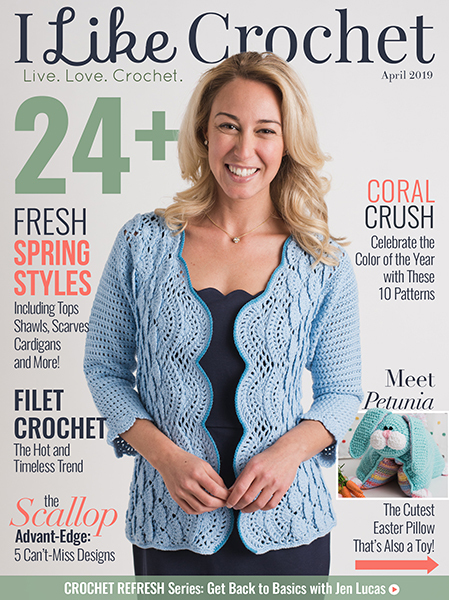 Do you have more knitting patterns?